Build Quality: Not classy, but functional, very solid and well put together. Sound Quality: When thoroughly cleaned the records tested were all like new bar any scratches or faults in the original recording. Value for Money: £349 is a very small price to pay for such a superb easy to use cleaner. Compared to the competition it’s a no brainer. The Pro-Ject vinyl Cleaner VC-S presents itself as actually quite a simple décor solution, and thus also corresponds entirely to the manufacturer's corporate philosophy. The aim is to offer an easy and simple for beginners to use solution that still offers optimum performance. Thus, the Pro-Ject vinyl Cleaner VC-S presents with dimensions of 435 x 335 x 280 mm, is compact, the housing is kept in discreet black. 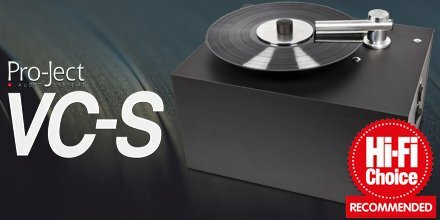 It is striking that the Pro-Ject vinyl Cleaner VC-S is based on a solid running plates made of metal, but not equal to the entire circumference of the record. The record will be fixed using a special clamp, which shall ensure that the label is well protected to clean vinyl. Even the arm for the extraction is carried out extremely robust and made of metal. A very stable, easy to handle mechanism without springs allows easy mounting and lifting the arm, which can be turned to the side to put the plate on the plate. In the arm cleaning lips are used on the underside of corresponding recesses, which eliminate any residual liquid during the suction. These are always in the form of Pro-Ject VC-S Self-adhesive strips as an accessory. 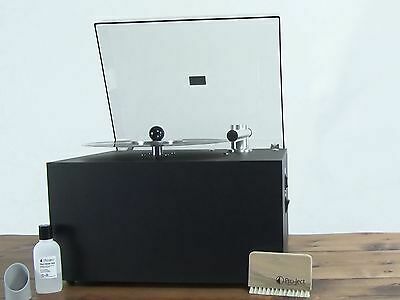 The Pro-Ject vinyl Cleaner VC-S is equipped with a particularly generously sized tank that holds at least 2.5 liters. However, this is not for the fresh cleaning liquid, but also to receive the used cleaning liquid. Via a viewing window on the side of the Machine , how much liquid is already in this tank, which also can be easily emptied, namely by tilting simply according to the side the Pro-Ject vinyl Cleaner VC-S. This is facilitated by the so-called Pro-Ject VC-S Spout again, a kind of "bill-outlet", which is placed in the tank opening. The cleaning is carried out at the Pro-Ject vinyl Cleaner VC-S first manually, in other words, the cleaning liquid is applied by hand, and uniformly applied with a brush, such as the Pro-Ject VC-S Brush, while the Pro-Ject vinyl Cleaner VC-S rotates the record to be cleaned. Thereafter, the cleaning liquid can be removed via Vacuum , for which the suction arm placed, and the suction through the respective switch is activated. Pro-Ject emphasizes expressly that the Pro-Ject vinyl Cleaner VC-S is designed to be particularly powerful and also rotates when compared to similar products very quickly. Only two seconds would require a full revolution and by the powerful suction would an already, two revolutions sufficient to completely remove all residual liquid. The manufacturer recommends that a rotation in a clockwise direction, a further counter-clockwise direction, and even the plate was perfectly clean, and so dry that it can be played immediately. Vinylgermany Review - The VC-S is a well thought through product to clean your beloved vinyl. Especially the fast cleaning process gives this vinyl cleaner an advantage over its competitors. I daresay this new vinylcleaner from Pro-Ject has a very good initial situation to be a hit in the market. It shows well thought out details, cleans incredibly fast and therefore is also a great alternative for the professionals. The biggest surprise is the suggested retail price, with that the vinyl cleaner VC-S has very good chances to become a permanent component in many households of vinyl fans. If you clean your LP according to the instructions, you may be shocked, that your record indeed is dry after one, maximum two rotations! Fingerprints on an older record have been gone using the included cleaning fluid, even purposely added grease stains and dust on openly left LPs has been completely removed after a standard procedure.